VisTech.Projects: How to use “Planimeter - GPS Area Measure” on iOS and Android in Manual Tracking Mode. How to use “Planimeter - GPS Area Measure” on iOS and Android in Manual Tracking Mode. Tracking Mode is one of the distinctive features of Planimeter - GPS Area Measure app. It can be used to measure track or path distances and to measure areas of objects or territories by driving/biking/walking around. You have an option to set GPS accuracy (if GPS is available on your device) and time interval for dropping a pin. If both conditions are satisfied, your current location is added to to the track automatically. Please note, mobile GPS provides accuracy ~2-3m in the best conditions, so make sure it is enough to satisfy your particular requirements. to see time interval options for Tracking Mode. “Set Point” button will appear at the bottom of the screen. Now when you start tracking, your current location - green pin - will be constantly updated as long as GPS accuracy condition is satisfied. When you are ready to add a point to your measurement track - just touch “Set Point” button. 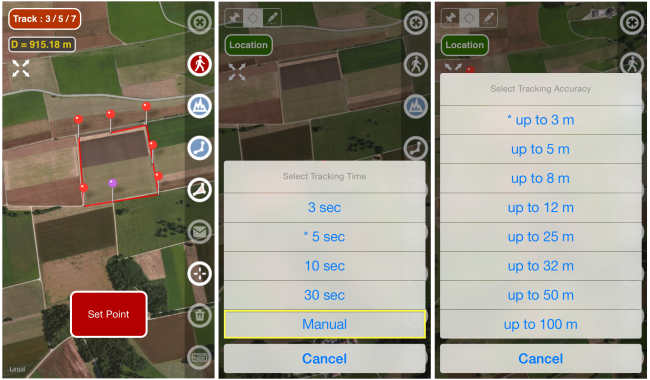 Tracking Mode with Manual option is a very handy feature and can be applied for different tasks. For example, it can be used for mapping objects or places for later use or visit. Another application where manual tracking can be useful is marking your property with poles. First you can manually (by touch) build a pole line on maps in Planimeter with required distances between pins. Then you can use Tracking with Manual option enabled to visually estimate your current location (green pin) relative to the planned path and red pins (poles) on it. As soon as you are close enough to the planned point you can place a pole and move to the next point. Described functionality available on both iOS and Android versions of the app.